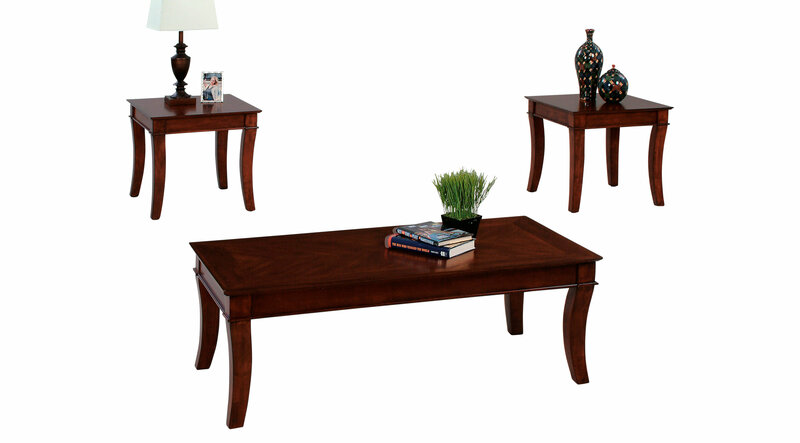 Transitional design elements create the versatile Colwyck table grouping for a variety of living room settings. Warm medium cherry finish highlights the hand inlaid birch veneer pattern on the tops while solid wood legs are gracefully shaped and flared for stability and visual appeal. Framed aprons provide a distinctive transition from legs to graceful tops. Cocktail table is a generous 48" long and 24" deep to scale properly with upholstery pieces. End tables are 24" x 22" and feature a 21" height for ease of use beside chairs and sofas.